Thanks for visiting the site! I am currently not able to respond to comments on the site, but there are some great resources for getting answers to your questions about mini pigs. One option is to do a search on our site to see if you can find the information you need in a previous post or comment. Another option is to join the group “Mini Pig Education” on Facebook and post your question there. That group is full of experienced pig parents who are a wealth of information and can provide quick responses to many questions for both potential and current mini pig owners. Hi Jordan. I am home with Oscar during the day, so I don’t have any experience with working outside the home while having a mini pig. While there are people who do well with having a mini pig while working full-time outside the home, it can be a challenge. Mini pigs are very smart and can get bored easily and, unfortunately, a bored mini pig is often a destructive mini pig. I would definitely continue to research and see if you can find people who also work full-time outside the home and get their opinions about keeping a mini pig entertained for that long. Keeping a mini pig stimulated and entertained is a challenge, so being away from home for that long makes it even more of a challenge. Unfortunately, I don’t recommend a mini pig for an apartment. 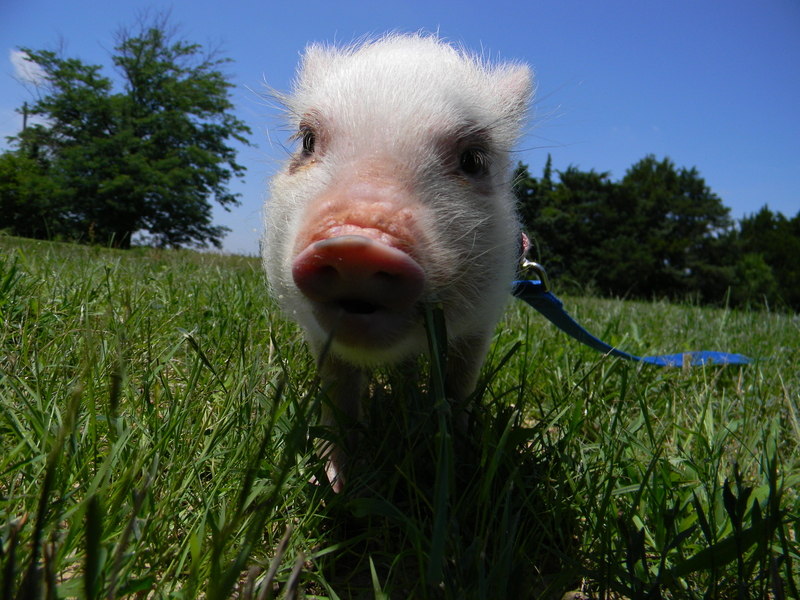 Pigs are generally very loud pets, especially when they are young. Their squeals are surprisingly loud and, unless a mini pig has been extremely well socialized by the breeder, they will squeal for quite a while when young until they are really adjusted at home. Aside from the squealing, they also grunt and oink throughout the day, which are much less loud than the squeal but could still be disruptive to neighbors in an apartment. My concern with an apartment is that, if the neighbors complained, you would be stuck in a really difficult situation of having to give the pig away unless you had other living options. Here is a post with examples of noises Oscar makes: http://lifewithaminipig.com/mini-pig-noises-with-sound-recordings/. For toys, I recommend checking out my post on toys for mini pigs. Different pigs like different types of toys of course, but these are the ones Oscar likes. http://lifewithaminipig.com/toys-for-mini-pigs/ Hope that helps! I work a full time job that is 45 min away from home. I usually leave Wilbur in my bedroom (so he can’t get into anything, he’s good for that) while I’m gone. I give him his breakfast in the room right before I leave for work. His litter box also stays in my room along with a big pan of water, he drinks a lot. When I get home is when I feed him his dinner and let him roam the house. Most of the time I can pretty much tell what he had done during the day, he usually sleeps, roots around on the bed, and tries to open my closet, which I know have learned how to keep it closed. If you have any questions please email me at (*edited). Thank you for responding on this, Haley! I’m only one source, so I love when other pig parents respond and help too. This is super helpful in answering a question I get asked a lot but don’t have the best answer for. Thank you! I just got my mini pig yesterday and it went smoother than I expected but I just want more than anything to bond with him. He still wont let me touch him but I finally got him to eat some cucumber out of my hand. I was just curious as to how your first few days with Oscar went? Hi Bethany! Congrats on bringing your mini pig home! The first few days for us were just going through the motions and trying to get Oscar comfortable. He was very similar with not really wanting to be touched, so we just spent a lot of time sitting in the same room with him and letting him get used to us and feel safe with us around him. He was super skittish and scared, so sitting near him was about the best we could do for a while. If we picked him up (which of course he squealed) and put him up in the bean bag chair with us, we could get him to settle and nap with us for a while. But, as soon as the nap was over, he was back to being scared. The bonding can be a really slow process, so for now just sit in the same room with him and let him move at his own pace. I found that rushing it only makes it worse because it can frighten them and set you back. Also, what you did with the cucumber is great because offering treats will encourage him to approach you and start trusting you as well. It takes some time for them to calm down, but it’s really rewarding when they start trusting you. Hi! I’ve had my Hamlet for almost 3 weeks now and he’s completely warmed up and I’ve figured out most aspects to raising him so far. However, his first trip to the vet a week ago, the doctor gave him a shot to clear up any skin mites he may have had (I got him from some nasty people who didn’t take care of him and his siblings,) the shot was also a dewormer. Unfortunately he did have worms and it has been the most unpleasant experience for both Hamlet and me. Did you experience any worm infections with Oscar? My mini pig squeals all night and gives us no sleep. I have tried everything and nothing seems to work. Do you have any suggestion?? I am considering getting a mini pig, but like some of the others, I work a full time job and am not home a lot during the day. I want to make sure that if I get a mini pig for my family, it will not disobey. Do you have any tips for teaching you mini pig how to behave or how to keep it from biting , etc.? My micro female pig is the only one I have, shes about 2 1/2 yrs. old, she free roams our farmyard w/chickens and dogs, always seemed to be very happy. I allowed her to get obese unfortunatlely and now she seems to be hearing and seeing impaired. I have stopped letting her help me clean out fridge and feed only mico pig feed and allow her to still roam for exercise. She does have an odd behavior she started last year, smelling food in front of her but backing up away from it, then approach it, only to back away from it again. She will eventually make her way to it, but she almost seems to be confused. Not sure what this approach and then retreat behavior is all about. Do you have any ideas? I absolutely love your page ❤️ I just got my mini pig this past Sunday, his name is Groot and he is 8 weeks new and is already bonding extremely well with me ✨. I was wondering at what time is it good to introduce veggies and fruits (for snacks, and extra for meals) the only thing he seems to be interested in at the moment is his small handful of chow in the am and at night. He also likes his chow as a treat when he does something good (I give him a few pellets). I’ve offered him dandelion greens and bananas so far, and he turns his little head away lol. Also, I want to start adding coconut oil into his diet, how do you figure out a good portion for them, and when can I start adding that also? Greetings I hope this message finds you well. I have been watching your minipig videos and think your minipig is gorgeous, and I read your homepage, and seen that you began experiencing some difficulties with Oscar. Although, you did the research and found popular media abouthumans and their standard practice/ way of dealing with “pigs” they call spoiled, I would like to offer you an alternative perspective, From the dawn of man, we are known to be egocentric, and if you can keep an open mind, you might find this enlightening. Humans have many ideas and popular practices and perhaps you question the authenticity or effectiveness of some of these, such as modern medicine, political ideologies, and religious beliefs? For instance, religion is one we commonly see a divide of opinions about: mulsims, christians, jewish faith, atheists, we can’t all be correct right? Well in that spirit, for issues that don’t concern a large amount of people such to be classed as significant), such as”minipig ownership, or issues that aren’t considered pressing for humans, its not uncommon for one theme to be considered relevant, such as euthanizing pets etc. its very popular. Well, humans like to own pets, obviously, and we want to love them and be loved, and so I understand your frustration, but what’s not published is that we take so much from our pets in return like when we neuter them so they can no longer have families of their own, or carry out instinctual practices. This is taken so lightly and for granted by us. I would disagree with popular culture, as it seeks to enslave the pig further to the human who while he may not appear to be disheartened by it, he really is being abused further. He has no one else to love him, or feed him and he truly looks to you as his sole care giver and the one that he does love even when he expressed his frustration to you. Him not doing so now doesnt mean he is any happier he is just distracted with more repression. If you are truly interested in keeping your pig content, I would look to finding alternative ways of filling that voice in your pig’s life. It may take time and alot of trial and error but you will have a happier more fulfilled pig who will express his love to you more often instead of taking out his grumpy side on you, which before you may have taken as a sign of hatred, or ungratefulness. Minipigs, although domesticated are pigs, and in the wild pigs begin mating as early as 6 months of age and frequently! Can you imagine, what an adjustment he;s made to be a pet? Ok my day two being a mini pig mommy and it’s going well. He’s started to chew on things and I can only get him to eat if it’s off my foot!!! Crazy weird lol. I figure as long as he’s eating something then I’ll let him go. He started nibbling on my big toe and he hasn’t eaten so I put a bit of food there and he started eating. I really love him!!! He won’t let visitors hold him without squeeling he only wants me to hold him and sleeps next to me. If in the kennel will only come out for me also. Wilbur is very loving even when though he has had 2 tantrums already. Hi there, I’m having issues with my pig trying to establish dominance over my dogs. Neither of my dogs are small, one of them is giant. He is a Rhodesian Ridgeback- rottweiler mix. He doesn’t act aggressive towards the pig but I’m afraid he will if she goes up to him and starts biting in the air and barking near his face like she has to my other dog. My other dog is old and just lunged at the pig when she does this. Still it scares me, and I don’t want her to get hurt. I ALWAYS watch my piggy when she is with the dogs but sometimes she runs up to them so quick I’m afraid I cant get there in time. Does anyone have any advice to make her stop doing this? Thank you. I would like to personally congratulate you as your blog Life with a Mini Pig has been selected by our panelist as one of the Top 40 Pig Blogs on the web. I personally give you a high-five and want to thank you for your contribution to this world. This is the most comprehensive list of Top 40 Pig Blogs on the internet and I’m honored to have you as part of this! I’m missing Oscar and watching him grow! I hope all is well with him and your family! Hi! We are thinking of adopting a mini pig and were wondering how many hours a day you have to spend with pig so it doesn’t become lonley? There are two working parents, and 4 girls in our family who are at school from 9:00-3:00. Of course the kids also have sports and extra carricular activities. Hello, I’m the pig mom to a 5mo old mini pig. We’ve had her since she was about 2 months old. She’s very sweet and loves to snuggle up to people and always wants to be touching someone. However, miss Petunia will not sleep through the night. Every night around 4am she wakes up the entire house by screaming for what feels like hours. We’ve tried putting a heating pad on low in her crate, putting one of my shirts in her crate with her, letting her sleep in bed with us, and even feeding her later to hold her over through the night, but nothing is working. HELP!! I have been following this site since before I adopted Hampton, and feel like I have done everything right, he’s loves to be cuddled, he eats good and has plenty of stimulation. I’ve had him for a little over a month now and for the first two weeks he used his litter box amazingly, but for the last two weeks he stopped. He still pees in there but he poops in the corners of the bathroom? I refuse to give up on him because the bond with a pig is something special:) please help! Thanks! My pig did this all the time…pooped outside the litter box but peed in it. Ever since I got a much larger litter box, he’s been doing much better. He will poop outside of it the odd time but he’s pretty much doing a perfect potty now! Hi. I just got a mini pig Friday 9/8/17. He did wonderful on the car ride home and that night he fell asleep on my chest. He’s done really good the past few days with eating and drinking. He don’t like to use the liter box he lays in it and poops outside of the liter box. And he only poops when I leave. I have got him to come up to me and eat out of my hand and all but he will not let me pick him up he starts screaming very loudly. I will call his name and play with him and he’s fine he just hated being picked up. Any advice on what I can do? At what age did you get him neutered ? did you have a problem with him “spraying” when he got upset before he was neutered? So we are based in South Africa and we have just bought a mini pig. We are absolutely in love with him. He has been challenging of late with his high pitched squeals and his nuzzling of his nose on our legs. However this site has been absolutely awesome with getting to know what he wants and the challenges we might face with him. I just want to say thank you so much for starting this blog. I hope I could email you on occasion to ask you a few questions. I am so very, very sorry for what you and your family have gone through having to give up Oscar. I just wanted you to know how much I admire and respect you. You clearly loved and love Oscar as a family member and I know how hard it must have been to give him up. It doesn’t matter what people say, negative or positive. Only you are in your shoes and know what’s right. For what it’s worth, I would have made the same decision. You have done such a wonderful thing sharing Oscar with the world and ALL your experiences. You’ve probably saved countless people the anguish that you and your family have gone through. I am one of those people. I will not consider adopting a mini-pig unless my situation changes and I’m able to provide a proper and secure place for all my animals to live their best lives. I hope others will listen to and benefit from your extremely wise messages. You are truly a lovely soul, clearly a wonderful person and a gift to all. Hi Gina! I just wanted to say thank you for such a kind, supportive message. I really appreciate everything you wrote and that you understand how much we love Oscar and how hard it was to give him up. I definitely hope I can save others from that anguish just by sharing information and putting it out there into the world. Just wanted to let you know that I am out here listening and received your message and wanted you to know how appreciated it was. All the best to you as well! I just wanted to say thank you! I am new to being a pig parent and your site has provided me wonderful information! I really appreciate it! I live in austin, TX. thoughts on where to castrate my piggy? Hi, Kezi. I live in Austin, too. We got our boy neutered at North Austin Animal Hospital. They’re great! Hi! I have a question. How much does Oscar weigh now? Our pig was growing around the same rate as Oscar, and he’s 113 pounds now!